Joseph A. Carpenter Jr., a beloved Rehoboth resident descended from one of the founders of the town, enjoyed a successful career as an art director, artist, illustrator, and cartoonist. After serving in the Army’s Air Corps during World War II, he graduated from Rhode Island School of Design. He was an art director at the oil filter manufacturer Fram Corporation in East Providence for twenty-four years. During this time, he contributed humorous cartoons and illustrations to many publications. He spent much of his retirement painting oil portraits of friends and watercolors of landscapes. 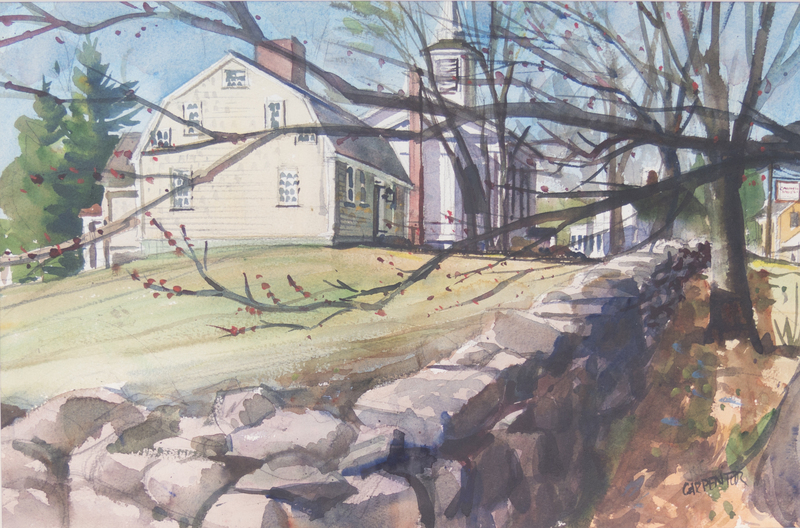 This watercolor of the Carpenter Museum in Rehoboth Village epitomizes his sketch-like style, which captures the play of light and shadow over the wind-swept buildings and grounds. Joe’s deep commitment to the Rehoboth Antiquarian Society and the Carpenter Museum, where he served as a trustee for many years, spoke to his strong interest in history. Here he neatly sums up the town’s past by not only portraying its history museum surrounded and emphasized by the bare branches of a foreground tree, but by prominently featuring a stone wall, a symbol of the town’s agrarian past when barriers of this sort demarcated farmland boundaries. Also included are the 1838 Congregational Church (before the Parish House was added to the back in 1985), and the eighteenth-century Jonathan Wheaton House at the far right, which served over the years as a post office, general store, masonic hall, and doctor’s office, as well as a residence to several generations of Carpenters.